The life's journey of Chief Gabriel Osawaru Igbinedion started in the small farming village of Okada, in the present Ovia North-East Local Government Area of Edo State, Nigeria, on 11th September, 1934. "The Heavens," as Shakespeare would say, "did not blaze forth his birth," for his parents, though of proud and noble heritage were of humble beginnings. He was born to the late Josiah Agharagbon Oviawe Igbinedion and Madam Okunozee (nee Ihaza) a descendant of the Royal House of Usen. It is no easy task to render an exhaustive account of Chief Igbinedion's conquest on the global business arena. However, it is pertinent to say "The Chief's numerous companies have over the years had interest in diverse areas such as aviation, radio and television broadcasting, banking, salt manufacturing, crude oil exploration, solid minerals, soft drinks bottling, real estate, fruit and fish farming, palm oil production, petroleum and gas marketing, shipping, haulage, road transport, confectionery and hospitality, among many others." but perhaps one of his greatest legacies will be the pioneering of Mid Motors (Nig.) Limited in 1968, the first indigenous motor assembly plant in Nigeria. 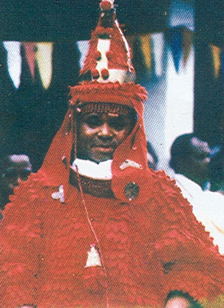 It is often said, sometimes enviously, sometimes admiringly, but always with a hint of awe that Chief Gabriel Igbinedion, The Esama of Benin Kingdom, has exercised more power over a longer tenure than any business leader in Nigeria today. Chief Igbinedion, is too polite to make such a claim himself, but he tacitly acknowledges its validity. When asked what he has learnt about being so powerful on the Nigerian business terrain, he smiled and said, "It is tough and lonely at the top." Everything Chief Igbinedion does creates a chain reaction, often leading to unexpected combinations. With Chief Igbinedion now 70, his reign on the nation's business front might seem in its twilight. However, it is with gratitude to the Almighty God that it is acknowledged that the aging "Lion of Okada" has many competent children who are poised to play roles he now plays in all his businesses; but the convivial Esama still seems frisky and in no hurry to step aside. Until he does, he will continue to play the role he dearly relishes; powerful unrivalled, setting the pace and standards for others to follow and most of all, that of being imitated! There is no doubt that the name GABRIEL OSAWARU IGBINEDION has become synonymous with courage for he has always been a man who treads where others dare not go. During the peak of Nigeria's oil boom in1981, Chief Igbinedion saw the need for the active participation of the private sector in the aviation industry. 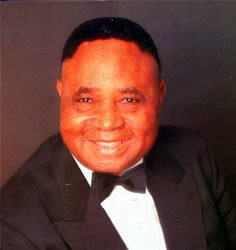 In that same year Chief Igbinedion purchased his first private aircraft through Mr. Derek Lowe of Executive Jet Sales. The HS125, was launched and blessed at Benin Airport by His Royal Majesty Omo N'Oba N'Edo, Uku Akpolokpolo, Omo N'Oba Erediuwa, the Oba of Benin. 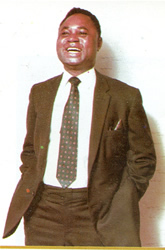 Thereafter, in 1983 Chief Igbinedion boldly recorded the first private initiative in the fledgling industry when he established Okada airline Ltd. His next venture was the purchase of a BAC 1-11 executive jet which was formerly owned by the deposed President Ferdinand Marcos of the Philippines. Chief Igbinedion was enraptured with the BAC 1-11. By 1988 the Okada Airline fleet comprised two executive BAC 1-11 and nine BAC 1-11 passenger/cargo aircrafts. This feat was accomplished with the help of Mr. D.H. Walter of British Caledonian who was responsible for the sale of the BAC 1-11 fleet from Sir Freddie Laker of Laker Airways. From that moment on, Okada Airline, began to grow by leaps and bounds. With the support of major aviators such as British Aerospace, Rolls-Royce, Aer Lingus, Dan Air, Rogers Aviation, A.J. Walter, FLS Aerospace, Dunlop Aviation & Tyres amongst others. At the climax of Okada Air's tale of success, Chief Chief Igbinedion amassed a fleet of thirty two aircrafts. Chief Igbinedion made history with the acquisition of a Boeing 747 Jumbo Jet. The B747 was officially commissioned by Vice President Augustus Aikhomu on behalf of President Ibrahim Badamosi Babangida who also graced the occasion. The arrival of President Ibrahim Badamosi Babangida in recognition of this unparalleled achievement by a Nigerian citizen gave the commissioning ceremony the Presidential Seal, and launched the aircraft into service. This auspicious ceremony took place at the Abuja International Airport on 7th May 1992, making Chief Igbinedion the Chairman of Okada Airline, the first black man in the twentieth century to own and operate a Boeing 747 aircraft. Chief Igbinedion is today the Honourable Chancellor and Chairman of the Board of Regents of the first private University in Nigeria Igbinedion University Okada. This position which he now occupies is a befitting tribute to his over 15 years of tenacious struggle to bring about a phenomenal development in education. It was a struggle of his life to which this relentless businessman selflessly committed enormous resources, time and energy. He commenced the actualization of this vision with a candid representation to former President Ibrahim Badamosi Babangida, GCON, in1986 and pursued this agenda throughout the tenure in office of Chief Ernest Shonekan (Head of State) and Military President Sani Abacha. His request was finally granted by General Abdulsalami Abubakar GCON, Commander-in-Chief of the Federal Republic of Nigeria. Chief Igbinedion was then presented Certificate No. 001 by the Federal Government of Nigeria on Monday 10th May 1999 at a colourful ceremony held at Nigeria Universities Commission, in the Federal Capital of Abuja, signalling government's approval of Igbinedion University Okada as the first private university in Nigeria. RELIGION: He is of the Baptist Faith and was made a Knight by the Anglican Communion in 1992. 1. Chairman/Group Managing Director, Okada Group of Companies. 2. Founder/Chairman, Board of Directors, Igbinedion Education Centre, Benin.City. 3. Founder/Honourable Chancellor/Chairman, Board of Regents, Igbinedion University Okada, Edo State. 2. 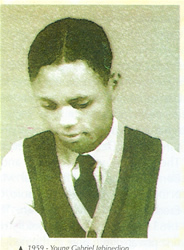 Eko Boys High School, Lagos (Secondary School education was truncated by his father's death. Has established companies in the industrial, commercial, aviation and education sectors and sub-sectors of Nigeria. He is the Founder/Chairman of the Board of Igbinedion Education Centre, Benin City, Edo State (The School comprises Nursery, Primary and Secondary Schools in addition to the Igbinedion Montessori Teacher Training Centre, Benin City. He is also the Founder/Chairman, Board of Regents and Chancellor of Igbinedion University, Okada. 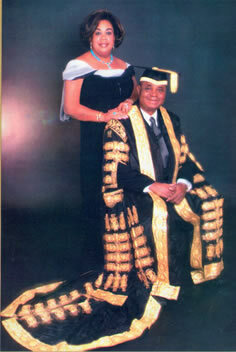 Honorary Doctorate Degrees have been conferred on him by seven universities in Nigeria and three universities abroad. Chief Igbinedion has received honorary awards from 38 organisations and bodies including the Paul Harris Fellow. He has received Professional Awards from 12 prestigious professional bodies. The Igbinedion Education Centre is today the sole trustee of the Montessori Concept of Early Childhood Education in Sub-Saharan Africa. Chief Igbinedion has safely secured a place in history for his immense contribution to Nigeria through education during the 20th and 21st Centuries. Most significantly, humanity will always acknowledge his contribution to Human Development through mass employment. He is Grand Patron of twenty one national and international organisations. 1. Appointed Justice of the Peace (JP) by the then Bendel State Government (1986). 2. Award of Africa's Man of the Year 1998 by African World News (1988). He has been honoured with over 32 chieftaincy titles across the country, including the Esama of Benin Kingdom and The Gwang Taruk of Jos among many others.